We played hard. I got no complaints about anything to do with our team. 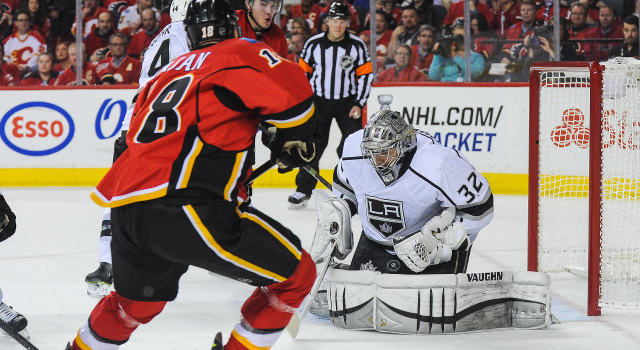 Give the Calgary Flames lots of credit. Now, I get to pull for them. I think…probably the disparity in home and road. If you looked at it, if you broke it down into individual stats and probably two or three team stats, there would be a big difference. I think we gave it all we had. We’ve played for a long time here. I think it probably did. But you know what? We still have a game on Saturday that I want to make sure that we’re ready for and try and that we try and win for our fans at home. We’ve won two championships there. You always want to win your last game. We want to win on Saturday. That’s what I just said…[Reporter: Over the summer, I meant, going forward, going into next year-] The season’s not over yet, is it? I think there’s lots of guys that gave it all they had.